John Welles and his two best friends, Sam Feldman and Claude Willoughby, formed a strong friendship during their two years of pre-med studies. By 1927, when they began studying medicine in earnest, they were inseparable despite the differences in their personalities. It was their closeness that allowed John to pick up on the problems with Claude’s family life that his friend tried to keep hidden. After the boys naively crossed the line by interfering with Claude’s father’s private business, the once subtle problems exploded to the surface. John felt powerless to help Claude. Worsening the issue was J.D. Willoughby, Claude’s Father, who infuriated John by maintaining a polished veneer on the situation in an effort to keep up appearances. J.D. Willoughby was the type of man who didn’t even flinch when he realized John and Sam overheard him yelling threats at Claude. Instead, he ushered Claude’s friends to the kitchen, treating them like ignorant children and distracting them with freshly baked cinnamon rolls. The following recipe is the one I had in mind when I wrote the above-mentioned scene. 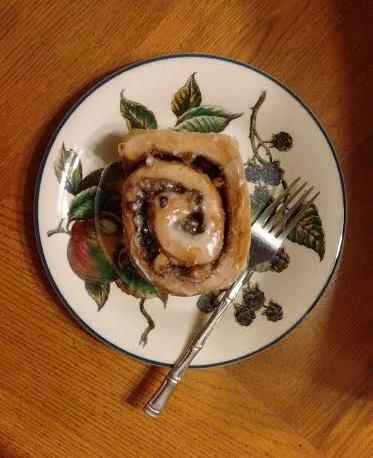 The sinfully rich, delicious baked good is a cut above a regular cinnamon roll with the inclusion of bourbon, golden raisins, and Zante currants; it’s just the sort of dessert J.D. Willoughby would expect to be served in his home. They are so luscious, I hesitated to attach them to such a despicable character. I trust J.D’s reputation won’t negatively influence your opinion of the recipe. In a small glass bowl, dissolve the yeast in warm water and set aside. In a large mixing bowl, combine the scalded milk, sugar, melted butter, salt, vanilla, and egg. Add two cups of flour and mix until it is smooth. Add the yeast/water mixture. Add another 1 ½ cups of flour until the dough is easy to handle. Knead the dough on a lightly floured surface for 5 – 10 minutes. This is where you may need to add the additional ½ c of flour a little at a time as you knead. 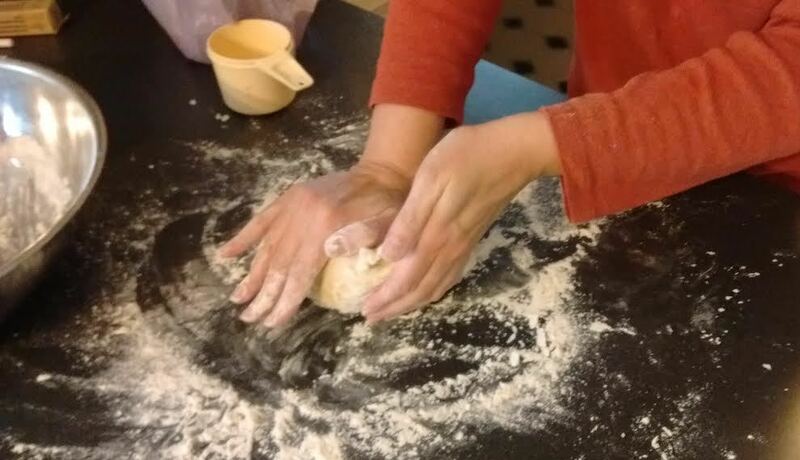 The dough should not be overly sticky on your hands. Place in a large, well-greased bowl and cover loosely with plastic wrap. Let it rise until doubled in size, approximately 1 to 1 ½ hours. Place the golden raisins, Zante currants, bourbon, and vanilla in a small glass bowl. Toss the fruit to coat with the liquid, cover, and set aside. When the dough has doubled in size, punch it down and roll it out on a floured surface into a 15 X 10-inch rectangle. Spread half of the melted butter on the surface of the dough. Mix the sugar and cinnamon and sprinkle over the buttered dough. Sprinkle the raisin/currant/bourbon mixture and any remaining liquid over the dough. Sprinkle the walnuts over the dough. 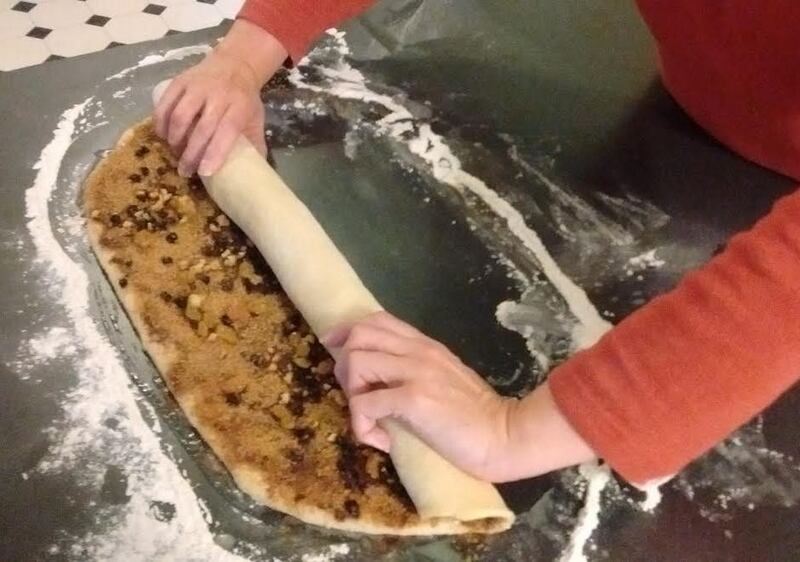 Begin with the 15-inch side and roll up the dough. Seal the long edge by pinching shut. Prepare a 9 X 13-inch baking dish by buttering the bottom and sprinkling it with sugar until coated. Cut the rolled up dough into 12 slices and place evenly in the buttered/sugared baking dish spiraled side up. Brush the sides and tops of the slices with the remaining melted butter. Let rise until double, approximately 45 minutes. Preheat the oven to 350° F. Bake the rolls for 30 minutes or until nicely browned. While the rolls are cooling, mix the melted butter, vanilla, orange zest, and powdered sugar with 3 T of orange juice. Stir until smooth, adding 1 T of juice at a time until the desired consistency is achieved. Drizzle the glaze over the slightly warm rolls. Serve immediately. These reheat well in the microwave for 10 – 15 seconds.